There is workshop session for lake water quality testing volunteers coming up on June 27th, 2015. 9:00AM in the Science Building at University of North Georgia Gainesville for coffee and snacks. 10:00AM-12:00PM Dr. Mary Mayhew will conduct a brief limnology class, which is the study of inland waters, and there will be Adopt-A-Lake training. If you are interested in becoming a trained Adopt-A-Lake volunteer, please send an RSVP email to lakeinfo@lakelanier.org. Interesting article featuring LLA’s Adopt-A-Lake water quality testing program and highlighting some of the issues in Flat Creek. Little River Community Clean Up sponsored by Keep Hall Beautiful on Saturday, October 27 at 8 a.m. in the North Hall Area. If you are heading north from Gainesville on Cleveland Hwy it is 1.5 miles past GA State Patrol Post 6 on the left (unmarked road before Citgo). Need lots of volunteers! Please spread the word. Shore Sweep 2012 is one week away! Similar to last year, for Shore Sweep this year, in addition to our day-of-event locations–marinas, Lake Lanier Islands, Clarks Bridge, and War Hill Parks–we also have nine advance drop off locations around the lake. The advance locations are open starting Monday, 9/24 through Friday evening, 9/28. You can go ahead and bring bagged trash or large items and leave them at one of these locations. We have volunteers with boats scheduled to pick up at all these locations on Saturday morning for removal. Especially if you are not available to help with Shore Sweep next Saturday, bringing items to the advance locations during the week is a great way to contribute to this event even if your schedule won’t allow you to be there on Saturday. Shore Sweep itself takes place Saturday, September 29th starting at 8:00AM and ending at 1:00PM. We still could use help with advance scouting of shoreline areas — particularly in the Hall County portion of the lake. If you are available to drive your boat around one day this week, scout shoreline and mark up a map, that would be very helpful to us as we deploy volunteers on Shore Sweep Saturday. If you are available to scout, please email us at lakeinfo@lakelanier.org. 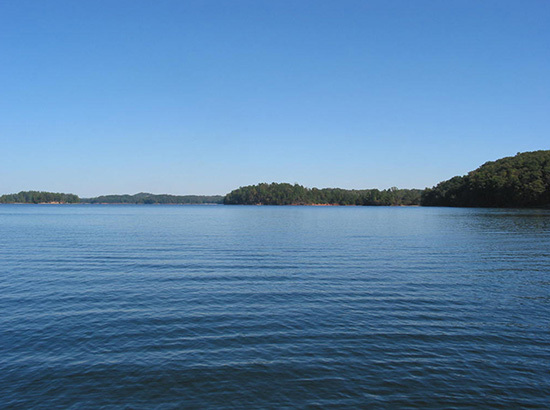 The Lake Lanier Association has an immediate need for grant writing assistance. As a 501(c)3 nonprofit organization, the LLA is eligible for several grant funding opportunities. The LLA tries to streamline overhead expenses, and, as such, is looking for ways to augment the limited support staff with volunteer assistance from the membership base for researching and writing grant proposals. This is work that can be done primarily from home with a flexible schedule. If you, or someone you know, is skilled at grant writing and would be willing to assist, please contact us at lakeinfo@lakelanier.org or by phone at 770.503.7757. Forsyth County marked the completion of the county’s first stream restoration project with a ribbon cutting ceremony held Monday, May 7. Located inside Forsyth County’s Midway Park, the stream restoration project was designed to improve overall downstream watershed conditions by stabilizing and restoring approximately 1,000 feet of degraded stream bank, using natural channel design methods. This project was supported by a United States Environmental Protection Agency 319(h) grant administered by the Georgia Environmental Protection Division. Objectives of this stream restoration project included reducing bed and bank erosion and sedimentation; improving channel stability, water quality, habitat and overall function of the stream; and restoring, enhancing and protecting riparian wildlife corridors. The project features a walking path along the stream and educational signage about the stream restoration project. Midway Park is located at 5100 Post Road in west Forsyth County. The project is on a tributary to Cheatham Creek in the Big Creek Watershed. Be sure to mark your calendar for the Shore Sweep event on Saturday, September 25th from 8:00AM-1:00PM. We are asking you to volunteer your time on this day to help clean up the loose Styrofoam and trash that has accumulated on our shore line. The Lake Lanier Association will hold the 22nd Annual Shore Sweep on Saturday, September 25, 2010 at thirteen locations around the Lake Lanier.